It was with this plot that comedian-actor, Jordan Peele (Keanu), launched his directorial debut into a film, and not just any film but one that reflects the underlying current of racism in our society as well as provides a riveting horror tale. Meeting the girlfriend's family for the first time can be nerve-wracking, especially when she is white and they haven't been told that you are an African-American male. Let's face it, for all the talk, racism still exists in this country. That was the dilemma for Chris Washington (Daniel Kaluuya; Sicario). He was going to the home of his girlfriend's, Rose Armitage (Allison Williams; Girls), parent's house and was nervous. However, it seems his fears were unfounded…or maybe they weren't. When they arrive at the house Rose's parents are welcoming and friendly but right away something seems a bit "off" with the two black servants who live there. Things get even weirder when the Armitage's throw a garden party full of older wealthy white people – except for the one younger African American male. Once Chris figures out something is going on its too late and he suddenly finds himself a hostage in the Armitage home. It was with this plot that comedian-actor, Jordan Peele (Keanu), launched his directorial debut into a film, and not just any film but one that reflects the underlying current of racism in our society as well as provides a riveting horror tale. Touted as one of the best horror films of 2017 so far, I tend to disagree with others on this idea. While I can see where Peele was going with the statement he was attempting to make, it just wasn't fully fleshed out to me. One of the brighter spots is the cast. Kaluuya gave a solid performance as a modern day Sidney Portier in Guess Who's Coming to Dinner. Williams portrays a decidedly different character than her usual jaunt as Marnie on Girls. The duality of her character is essential to moving the story along and she plays it beautifully. The remaining cast is well fleshed out especially Bradley Whitford (Cabin in the Woods) as Dean Armitage, who seems to be the caring father with a deeper, darker secret. 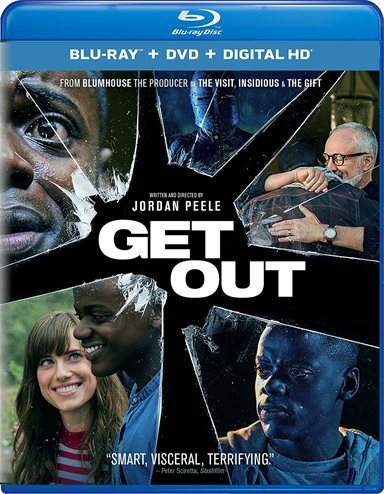 Presented in 1080p AVC Get Out is displayed in its original 2.39:1 aspect ratio. The colors are a bit muted, but this is done on purpose and gives the film an utterly surreal feeling as you watch it. As with most current releases, black levels are spot on and there are no visible signs of artifcating. The soundtrack is presented in DTS-HD Master Audio 5.1 and offers a decent mix with dialog that is crisp and clear and a soundtrack that does not overwhelm the film. The Blu-ray extras are limited and frankly aren't all that interesting. The alternate ending (1080p, 3:39) is the best of the bunch and also comes with optional commentary from writer/Director Peele. The 11 deleted scenes (1080p, 23:03) offer some humorous moments while others are simply unnecessary (which is why they were deleted in the first place) and the Q&A with Writer/Director Jordan Peele and the Cast (1080p, 5:28) was good but would have been more impactful if it had been longer. I didn't particularly enjoy the Unveiling the Horror of Get Out (1080p, 8:50) but found some of the Audio Commentary (with Peele) interesting. While Get Out might not have entertained me as I feel it had the potential to, it still is a very solid movie that helps address some of today's societal issues as well as showcasing the many talents of Jordan Peele. It is evident after this film he has a long career coming to him.